Odysseus was one of the Greek kings who went to Troy and came back a hero. He was ruling the small island of Ithaka when he was asked by the Atreidae to join forces with them on the expedition to recover Helen. The portrayal of Odysseus in the Iliad marked the beginning of his literary career. As he moved through time, additional elements of his character were emphasized and extrapolated upon, but all the seeds for later development can be seen in the Iliad. Did the depiction of the Iliadic character of Odysseus change in subsequent literature? And how was he portrayed in later Greek tragedies? These words are supposed to encourage the Achaians, but inadvertently cause a departure from the war. Agamemnon is the king and the men who make up the rank and file do not need to be told twice. But it was the will of Zeus that Troy should fall and for that reason, Athena goes directly to Odysseus and uses persuasion to elicit his help to stop the exodus. This marks the beginning of a long and diverse relationship between Odysseus and the goddess, which could be best described as a friendship. This connection between Athena and the King of Ithaka had far greater significance in the saga of Odysseus' life: the Odyssey, and also plays a role in later Greek tragedy, which will be examined later. Athena must believe that her choice of spokesperson will have the needed affect on the Achaians. Odysseus may have come to Troy with only twelve ships, but nine years later, he is seen as a man with enough power and presence to take the holy sceptre from Agamemnon's hands and use it to restore some degree of order to the chaos. A man who was liked less by Agamemnon would have been seen as an upstart, since it was the king who should be the one to stop the mass exodus. Achilles tells Odysseus that there are many reasons why he will definitely not return to the fighting and instead, will return home to Phthia, but his tutor Phoinix and his friend Ajax seem to soften his anger. He tells Phoinix that in the morning they shall both decide if they should return home, and to Ajax he pledges to return to the battle if Hektor reaches the ships of his people, the Myrmidons. The embassy has succeeded in changing Achilles' mind in some ways, and there seems to be some cause for hope. Why then did Odysseus only repeat the words Achilles spoke to him when he returned to Agamemnon and the others, omitting the more hopeful conversations that Achilles had with Phoinix and Ajax? When he did not, why then did Ajax not expand on what Odysseus related to the king? The answers to these questions are open to speculation. Did Odysseus assume that the best course of action was to put thoughts of Achilles aside since his future involvement was so precarious, and better to plow ahead with other strategies? Or was he so confident in his own capabilities that he decided that all was lost if he could not change Achilles' mind? Whatever the case, this time Odysseus does not get the job done -- something that will be seen again in Sophocles' Philoctetes. Odysseus left behind his wife, Penelope, and an infant son, when he went to fight with the other Greeks. He did have responsibilities to his family and his subjects, and was trying not to take chances with his life. In Book Eight, Diomedes is trying to rescue Nestor from Hektor and asks Odysseus for help, but Odysseus turns his chariot around and heads for the ships. Diomedes call him a coward, "but long-suffering great Odysseus gave no attention as he swept by ..."(14) Heroes were not expected to fight every minute of every battle to be considered brave, and Odysseus is certainly not a coward, although "he is quite prepared to run rather than face suicidal odds in battle. "(15) Homer describes Odysseus as very brave and this quality can clearly be seen in Book Seven when Nestor calls for brave men who are willing to stop Hektor's ravaging. Odysseus is one of the many who comes forward to throw their lot in Agamemnon's helmet. Also in Book Ten, the Greeks are seen in terrible straits, beaten back to their ships. Nestor has advised them that they need to know the Trojans' future strategy so they will be in a position to counteract it. He again calls for volunteers to cross enemy lines. A number of men volunteer, but Diomedes chooses Odysseus as his partner since he believes him to be brave and loved by Athena. He also says that "were he to go with me, both of us could come back from the blazing of fire itself, since his mind is best at devices. "(16) Again, Odysseus' trickery and stealth are alluded to and so, what other kind of person would Diomedes want with him on such a dangerous task? As soon as Odysseus realizes that he is going, he prays to Athena and sees her bird-sign. He seems to look to her as his own personal daimon. It should be pointed out that it is probably easier to be brave when a goddess like the powerful Athena loves you and protects you. There also can be no question that Odysseus carries out most of his actions for the same reasons that the other heroes do: for glory. Heroes are primarily looking for material wealth and for immortal glory. In Book Six, Helen talks with Hektor about the activities of heroes that will be sung about by the poets. In Book Eight of the Odyssey, Demodocus, the bard, sings of Troy and all the heroes who died there, for King Alcinous and his guest Odysseus. In some respects, the description of the night mission into enemy territory creates the greatest moments of apprehension and fear in the poem. Besides being the only military operation to take place in the dark, the reader also seems to be creeping along with Diomedes and Odysseus, who are slowly making their way through body parts and pools of blood. Hektor has also sent out a spy that night, a man named Dolon, and it is "illustrious Odysseus"(17) who hears him approaching and thinks of a plan to trap him. Diomedes savagely kills him. Odysseus asks Athena for guidance in finding the way to the newly arrived Thracians, who have brought many horses with them. Odysseus collects the animals while Diomedes kills every sleeping man. When they return to their own ships with the booty, Odysseus gives the credit to his comrade and never mentions his own input. (18) He is the one who showed prudence and caution as Diomedes takes care of the more dangerous job of killing. All in all, the incident shows that Odysseus is brave, modest, and protected by Athena. This is illustrated again in Book Eleven when Odysseus is stabbed by Sokos, and yet saved from death by the goddess. Odysseus is again commissioned to hold the army together. Agamemnon wants to move some of the ships and believes the gods are against a victory for them. He ends his speech with, "the man does better who runs from disaster than he who is caught by it. "(19)These words could have been spoken by Odysseus himself, but instead, he is brave enough and angry enough to stand up to Agamemnon for speaking them. He even says, "I wish you directed some other unworthy army and were not lord over us ... "(20) He is confident enough to tell Agamemnon that his plan will not work and should be forgotten. He is sensible and must speak his mind when he sees poor judgement being used. He also tells Achilles that the men need to rest and eat before they can do their best in battle, and to send them out would be foolhardy. Odysseus again fails to convince Achilles and he does not eat. Later, Athena must give Achilles nectar and ambrosia for strength, proving that Odysseus was right again. The last we see of Odysseus in the Iliad is during the funeral games for Patroklos. Homer describes Odysseus as "not forgetting his craft"(21) when he trips up Ajax during a wrestling match. Odysseus then joins the foot race and will seemingly lose without Athena's help and prays to her for extra strength. Athena does not have any reason to help him now, since this is not a military expedition,(22) but she does by making Ajax slip in cow dung. The competition between these two men had very serious consequences for the future, when Ajax is certain he was maneuvered out of another prize by Odysseus. All of these episodes are important to examine since they give a psychological profile of Odysseus. Homer sees him as a man of words, who is capable, brave, sensible, modest, and patient. The Atreidae see him as a friend in much the same light and make use of his capacities as an ambassador for them, and as someone to hold the army together. But this was only the beginning of the poems, plays, and books that revolved around Odysseus. Homer's second epic poem has him as a central character and focuses on many of the qualities he is first given in the Iliad. He uses disguises, calls himself 'nobody' and his trickery is shown in full force in the Odyssey. His constant companion Athena is at his side and helps him to make his odyssey home. His cunning is used to escape the Cyclops and to listen to the Sirens; to fool his wife and son; and to entrap the suitors. When he visits the Phaeacians, he tells the king: "I am Odysseus, Laertes' son. The whole world talks of my stratagems, and my fame has reached the heavens. "(23) His sagacity is also evident by how he patiently survives all the years away from home. The Odyssey must be mentioned in a discussion of Odysseus because without it, a large gap of material is left out of his tradition. On reading it, the warmth and admiration that Homer had for Odysseus is clearly evident. This will be contrasted with the writings of many other Greeks. The other important point to make concerning the Odyssey is that it mentions the Trojan Horse. Odysseus may have gone grudgingly to Troy, with only a small battalion of men, but he ingratiated himself with the important Greek generals and gained their respect and trust. And he was the one who came up with the plan to use the Trojan Horse that allowed them to enter Troy undetected. Of course, it was built with Athena's help, but the idea for such a sly and cunning invention came from no other than Odysseus. So Odysseus accomplished what Achilles could not: the sacking of Troy. Pindar must have felt quite strongly about this because he writes of it again in Isthmian 4 where he refers to Odysseus' famous traits of trickery and lying, saying they were used to win Achilles' armor. (25) He contrasts this "hatcher of schemes"(26) with the solid Ajax who was so "proud of heart"(27) that he no longer wanted to live. Certainly, Homer also portrayed Ajax in a favourable light in the Iliad, and in the Odyssey presents him as the quiet, stalwart hero who is still so hurt by the incident that he does not want to talk of it, even in death. Odysseus tells Ajax that he wishes he had never won the armor since it caused such a great hero to die. Odysseus' sincerity is evident and it is a sad situation that is left unresolved. Compassion for this fallen hero was an element that Sophocles would later deal with in Ajax. With the coming of the fifth century BC, there seems to be a negative shift in the portrayal of Odysseus. Odysseus shows great sincerity when, instead of gloating with Athena over these events, he sees them as a tragedy -- the tragedy of a fallen Greek warrior and hero, who can never live down this disgrace. He realizes that if Ajax can lose so much stature, anyone can. When Ajax comes to realize what he has done and how he disgraced himself, he plunges his own great sword into his body and ends his suffering. When a great man falls from grace, it is always a long drop down and many people suffer. Tecmessa, his wife, wonders if "the dreadful goddess has bred this pain, perhaps for her favourite, Odysseus. "(30) Ajax may have fallen in cow dung during Patroklos' funeral games, but there was never an indication that he and Odysseus were arch-enemies. Ajax, just like Achilles, felt he was slighted when he did not receive the prize of the arms. Ajax could have accepted the decision like the noble man he was and kept quiet; he could have acted like he did when he saw Odysseus in Hades, but he did not. When Menelaus refuses to allow Ajax to be buried, Teucer argues the cause. He points out that his brother came as a king and brought his own men to Troy. Menelaus may be the King of Sparta, but he had no right to direct the affairs of the dead man. Of course, this is a flawed argument because the Atreidae did direct everything for ten years and it was also attempts on their lives that caused Ajax to kill himself. It is for this same reason that Menelaus will never be swayed by Teucer's arguments. Menelaus may have known the archer, but he was never in any direct command of him. The person to persuade him is someone he knows well, trusts, and respects. That is why it is Odysseus' arguments that win over the Atreidae. The skilled speech maker is now using his abilities to win burial for a man who deserves to be buried. R.P. Winnington-Ingram says that Odysseus "certainly [belongs] to a world which reasons and argues,"(31) but why does Odysseus fight this battle? Why does he risk the friendship of Agamemnon and Menelaus? Odysseus knows that Ajax was a brave man and says so. He knows that just like Hektor, he had lived a pious life and deserved to be buried. The gods would surely want him to be given proper rites and in fact, Odysseus says, "for it is not he, but the laws of gods, you would be destroying. "(32) R.P. Winnington-Ingram states that "it is not ... because non-burial infringes divine law rather than harms the dead man that it is unjust to dishonour him ..."(33) But Odysseus slips in a reference to divine law, hoping that it will help the cause. (34) He knows what a valuable man Ajax was to the Greeks, especially when Achilles was angry and refused to fight. Some writers portray Odysseus as risking his life when he opposed the Atreidae in this matter, but he never showed any subservience to them in the Iliad. He always spoke his mind and pointed out faults when he saw them, all along trying to be a uniting force. He was not risking his friendship or loss of prestige because their relationship had gone past that sort of tallying, and Odysseus was seen as their equal by the time of the action. Sophocles characterized Odysseus quite favourably in this play, but as the years went by and he was near the end of his career, he gave a very different portrayal of him in his tragedy, Philoctetes. Why? One can only speculate on things that happened so long ago. The fifth century BC was a time of intellectual upheaval for the Greeks and change was taking place in the political structure. Many people were questioning the old aristocracy and their power, and the assertion that arete was something rich people are born with. Men, who were called sophists came to Athens with the message that arete was a teachable thing and as long as they had money, anyone could be taught. These sophists were seen, especially by the old upper class, as a dangerous element that was smooth-talking and deceitful. A group who would end up causing havoc. In some ways, they were right and steps toward democracy were helped along by the introduction and innovations of men like Protagorus. Did Sophocles concentrate on some of Odysseus' well-known personality traits and turn him into a "political man, of a type which may be recognizable to fifth-century audiences? "(39) Whatever the reason, Odysseus is a different man than the one seen in Ajax, but some of his original characteristics were still evident. Throughout Odysseus' conversation with Neoptolemus, he uses phrases like "ensnare the soul of Philoctetes with your words,"(43) and "it is the tongue that wins and not the deed. "(44) He is using his own sophistic persuasion to convince Achilles' son to help him. He is taking advantage of Neoptolemus' good nature and his young age to twist him into submission. 'He' should be 'they' since he is only doing the dirty work for Agamemnon and will do anything to achieve his goal. Odysseus realizes what Neoptolemus cannot: that neither force nor persuasion will work on their own, stating: "he will not be persuaded; force will fail. "(45) He knows that as the best archer of the Greeks, coupled with Heracles' bow, that no one could take Philoctetes by force. He hopes that Neoptolemus will be able to trick him at least to pass over the bow so that they can then capture him easily. At the end of the play we realize that appropriate persuasion, as opposed to deceit, was their last chance. Odysseus knows the prophecy of Helenus but he only tells Neoptolemus as much as he wants him to know. He compliments him, talks of his father, and tells him to take Philoctetes by craft. He is trying to ensnare him with his words and allows him to believe that he will be called a "wise man and a good one"(46) for his actions on the deserted island. Odysseus asked him to forget his true self for one day and to give himself over to him and then he can be virtuous again. What Odysseus did not factor in was the possibility that Neoptolemus and Philoctetes would become friends, and that the young man would not be able to go against his true nature even for a day, even for glory. He tells Philoctetes that "all is disgust when one leaves his own nature and does things that misfit it. "(47) Neoptolemus is not like the Odysseus who is portrayed in this play, and he is unable to accept that the suffering of this Greek man was allowed to continue for so long. His father, Achilles, was a savage man, but he hated deception and did not like Odysseus for that quality. When Neoptolemus gives the bow back, Philoctetes tells him, " ... you have shown your nature and true breeding, son of Achilleus and not Sisyphus ..."(48) This was a later addition to Odysseus' lineage. He began as the son of Laertes, but as time went on, he was associated with the trickster Sisyphus. Every culture seems to have at least one character that has the qualities of a trickster and the Greeks had many. In the Theogony, Hesiod wrote about Prometheus, who had outwitted even the mighty Zeus on more than one occasion. (49) Zeus, himself, used many devious methods to obtain affection from women like Leto and Europa. Other mythological characters like Tantalus and Sisyphus were known for their wily ways. In the Philoctetes, Odysseus is portrayed as a combination of quintessential trickster and smooth talking sophist, who has no compassion for Philoctetes whatsoever and no qualms about corrupting Achilles' son. At the end of the play, his deceitful tactics do not work. He loses whatever hold he had over Neoptolemus and does not get agreement from Philoctetes that he or his bow will go to Troy. Neoptolemus gave the bow back to its rightful owner and agreed to take him home. Its original owner then appears to give directions. Heracles tells his old friend Philoctetes that he must go to Troy with Achilles' son and fulfill the will of Zeus. Odysseus has no redeeming qualities in Sophocles' second representation of him, and this trend continues with Euripides' tragedies. The pain and horror is evident as Hecuba tells her daughter of her fate. When Odysseus enters, he is calm and callous, telling the fallen queen not to get upset for 'it is prudent, even in bad times, to use common sense. "(53) This sounds characteristically Odysseus. Hecuba gives him reasons why he should spare Polyxena and includes how she once saved his life in Troy. Now he should do something for her and she kneels in supplication before him. Odysseus ignores her pleading and tells her that Achilles requested the sacrifice and it could not be disregarded. Hecuba tells her daughter to supplicate herself to Odysseus, but he prevents her from doing so. Polyxena accepts her fate, but kills herself. Her mother is treated with sympathy by no other than the cold-hearted Agamemnon. 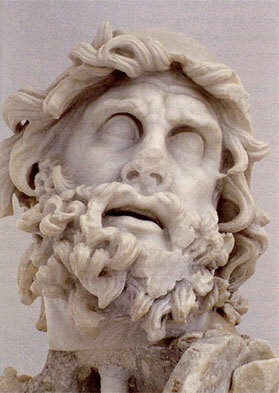 Odysseus is portrayed as an evil man, who has no compassion or understanding of human suffering. This is a contrast with the sympathetic man we see in Ajax. Hecuba is right to hate this man for soon she learns of his plan to throw her sweet grandson off the walls of her city, to die a tragic death. Andromache says, "But this is horrible beyond all measure! "(55) and it is to the reader, as well. When Astyanax is brought in on his father's shield, dead, Odysseus is really seen as an evil man, even if he is doing such things for the good of Greece because he shows no mercy for the Trojans. Odysseus went through many transformations from the time of the Iliad to the fifth-century BC, but in some ways he did not change at all. He began as a man of words and he ended up the same way, even if the words seemed uncharacteristic of him at times. Odysseus may be looked at in a positive manner, or in a very negative light, but he was one of the only heroes to survive the Trojan War and he always worked for the Greek cause. 1G.S. Kirk, The Nature of Greek Myths (Harmondsworth: Penguin Books, 1974) p. 169. 2Richmond Lattimore, trans. The Iliad of Homer (Chicago: University of Chicago Press, 1951) p. 80. 3Ibid., Book Two, line 244. 5Ibid., Book Three, line 200-3. 6W.B. Stanford and J.V. Luce, The Quest for Ulysses (London: Phaidon Press, 1974) p. 11. 7Lattimore, Book Three, line 222. 8Ibid., Book Two, line 169. 9Stanford and Luce, p. 21. 10Lattimore, Book One, line 440. 11Ibid., Book Nine, line 248. 14Ibid., Book Eight, line 97-8. 15Beaty Rubens and Olive Taplin, An Odyssey Round Odysseus (London: BBC Books, 1989) p. 81. 16Lattimore, Book Ten, line 246-7. 18W.B. Stanford The Ulysses Theme (Dallas: Spring Publications, 1992) p. 16. 19Lattimore, Book Fourteen, line 81. 21Ibid., Book 23, line 725. 22Stanford, The Ulysses Theme p. 29. 23E.V. Rieu, trans. The Odyssey of Homer (London: Penguin Classic, 1946) p. 124. 24Frank J. Nisetich, trans. Pindar's Victory Songs (Baltimore: John Hopkins University Press, 1980) p. 262. 28David Grene and Richmond Lattimore, Sophocles II (Chicago: The University of Chicago Press, 1957) p. 8. 31R.P. Winnington-Ingram, Sophocles (Cambridge: Cambridge University Press, 1980) p. 66. 32Grene and Lattimore, p. 58. 35Grene and Lattimore, p. 59. 40Grene and Lattimore, p. 195. 49M.L. West, trans. Theogony (Oxford: Oxford University Press, 1988) p. 19ff. 50W.B. Stanford and J.V. Luce, p. 141. 52Janet Lembke and Kenneth J. Reckford, trans. Hecuba (Oxford: Oxford University Press, 1991) p. 31. 54Philip Vellacott, Euripides: The Bacchae and Other Plays (London: Penguin Classics, 1954) p. 99. 56Edward Tripp, The Meridian Handbook of Classical Mythology (New York: Penguin Books, 1970) p. 440. 57W.B. Stanford and J.V. Luce, p. 141. Grene, David and Richmond Lattimore, edd., Sophocles II. Chicago: The University of Chicago Press, 1957. Kirk, G.S. The Nature of Greek Myths. Harmondsworth: Penguin Books, 1974. Lattimore, Richmond, trans. The Illiad of Homer. Chicago: University of Chicago Press, 1951. Lembke, Janet and Kenneth Reckford, trans. Hecuba. Oxford: Oxford University Press, 1991. Nisetich, Frank, J., trans. Pindar's Victory Songs. Baltimore: John Hopkins University Press, 1980. Rieu, E.V., trans. The Odyssey. London: Penguin Classic, 1946. Rubens, Beaty and Olive Taplin. An Odyssey Round Odysseus. London: BBC Books, 1989. Stanford, W.B. The Ulysses Theme. Dallas: Spring Publications, 1992. Stanford, W.B. and J.V. Luce. The Quest for Ulysses. London: Phaidon Press, 1974. Tripp, Edward. The Meridian Handbook of Classical Mythology. New York: Penguin Books, 1970. Vellacott, Philip. The Bacchae and Other Plays. London: Penguin Classics, 1954. West, M.L., trans. Theogony. Oxford: Oxford University Press, 1988.